A “unique green” yacht that offers a completely new way of cruising. - Winner of the World Superyacht Awards 2016 – category Semi-Displacement & Three Deck Motor Yacht 30m - 40.9m - Sport Hybrid model actually records five between ShowBoats Design and World Superyacht Awards. 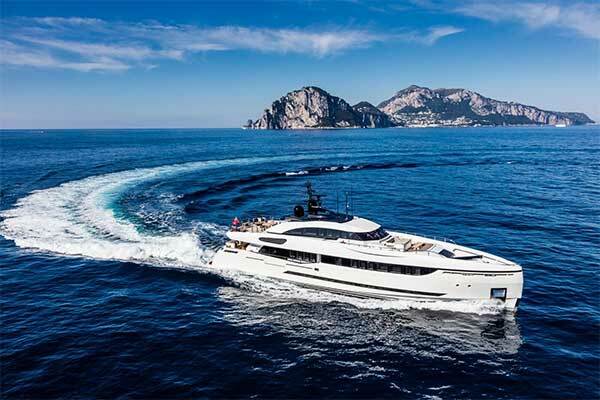 Aligned with the green approach to yacht building pioneered by Columbus Yachts, a brand of Palumbo Group S.p.A., the innovative M/Y Divine – second model of the 40 M Sport Hybrid awards winning series – will be on display at Monaco Yacht Show 2016 from 28th of September – to 1st October along the Quai des Etats-Unis. 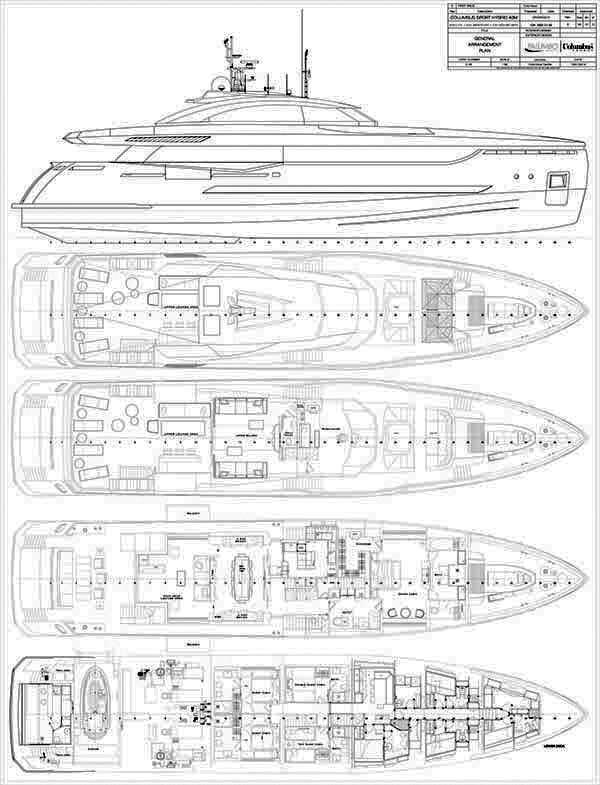 “Sport” indicates the high performance of this superyachts equipped with two diesel engines which will give a top speed of 20 knots, with the ability to easily cruise and with very low consumption at 16 knots. “Hybrid” is because of her “green credentials”. 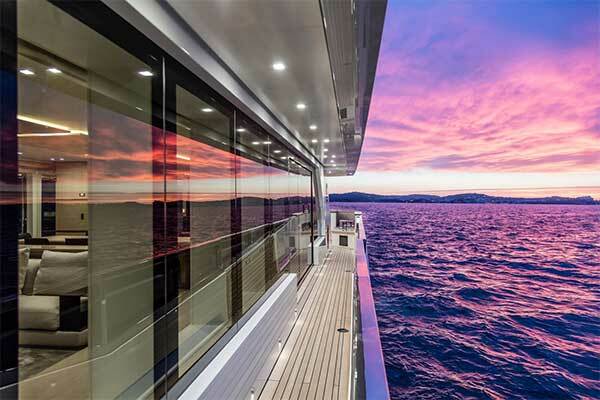 She is able to offer a completely new way of yachting, more conscious and respectful of the environment. 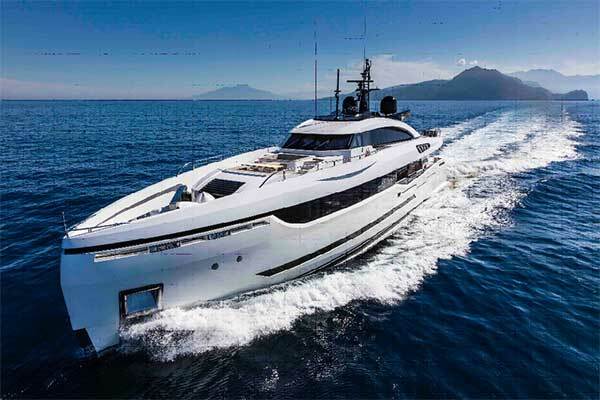 Three-decked aluminum M/Y Divine hosts ten guests in five staterooms with the owner's suite and study on the main deck, and she can accommodates eight crew members. 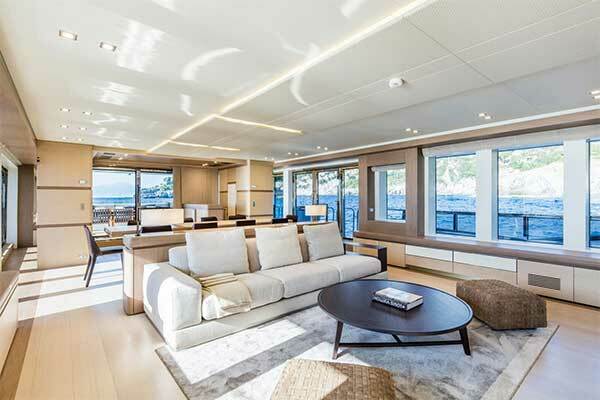 While naval architecture and exterior designer - in cooperation with the shipyard - is Hydrotec Srl, interior design has been conceived by Hot Lab. With its neat vertical bow and automotive-inspired lines, the architectural point of view M/Y Divine can certainly be considered a sport yacht although characterized by high volume and impressive heights, unusual for a yacht of this size. To reduce the mass of the hull structure from the side profile and offer uninterrupted views from the main salon, the bulwarks feature glass cut-outs that also serve as fold-down balconies. These are complemented by full-height glass doors, which were engineered by the Shipyard to either slide or hinge open. With the doors open and the balconies lowered, the salon becomes a floating terrace with unparalleled sea views. 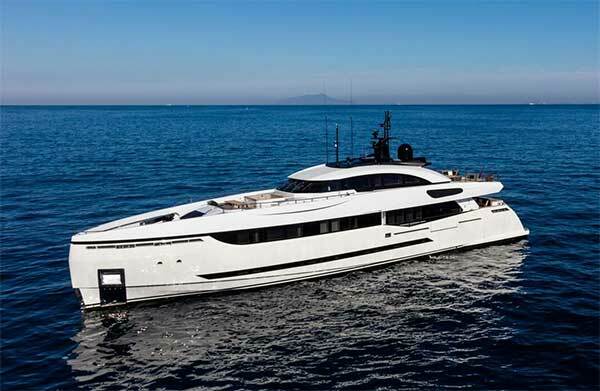 Columbus Yachts - a brand of Palumbo Group S.p.A - produces its own range of awards winning superyacht combining the best technical expertise with the excellence of Italian style. 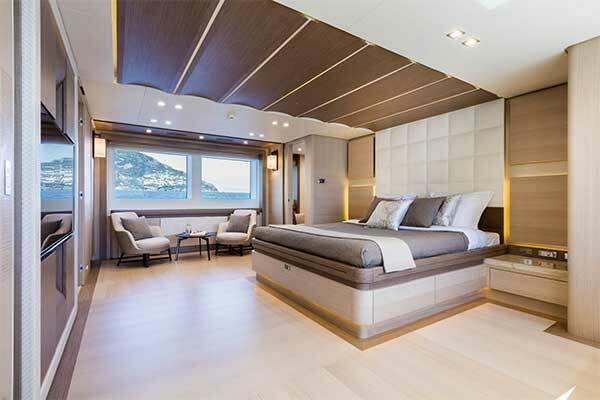 The collections of innovative design yachts - full custom oriented - merge a solid 50 years heritage of shipbuilding with an extremely technologically addicted production thanks to the strong in-house engineering team and the collaboration of top international design partnerships forward thinking and well knowledge project management organization. The actual range is available in four steel and aluminium distinct collections: Sport Hybrid (40/45/50 meters), Classic Oceanic (55/60/70/80 meters), Explorer (55/60/70/80 meters) and Custom. With four yachts on water so far - one 40m-year 2013 Sport Hybrid M/Y ELEONORA III and one 54m-year 2011 M/Y PRIMA - Columbus Yachts launched two new units in the 2015. The 40m Sport Hybrid – M/Y DIVINE and a 57m Classic – M/Y TAIBA. 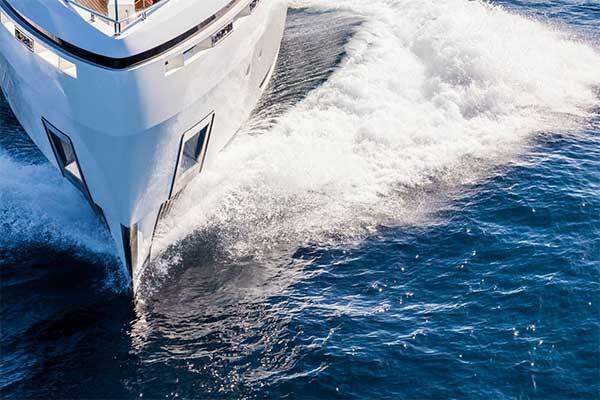 The forward-thinking Columbus Sport Hybrid collection is powered with the famous hybrid propulsion system – the first system in the luxury motor yachts industry in the world to obtain the “Hybrid Propulsion (Electric Motor & Shaft Generator)” Rina Class Certificate in 2014. With three 2013 Showboats Design Awards with M/Y Eleonora III and actually with M/Y Divine, Columbus Sport Hybrid 40M it's definitely an award winning model. Divine was awarded with a special commendation for her Naval Architecture at 2016 Showboats Design Awards and she is the winner of World Superyacht Awards 2016 – category Semi-Displacement & Three Deck Motor Yacht 30m – 40.9m. Columbus is building a 70 metres custom megayacht, with construction to begin on speculation. Columbus Yachts production facility is actually located in Naples, headquarter of the Group. The yard has 840m (2,755') of quayside for commissioning and completion works served by two berth-side cranes (7T and 12T) and six telescopic cranes (20T to 700T). The berths are equipped with all the necessary shore services. The yard has been certified ISO 9001 since 1998, ISO 14000 since 2005 and conforms to the organizational and management model under the OHSAS 18001 standard. All activities are carried in compliance with existing laws and regulations concerning environmental protection. 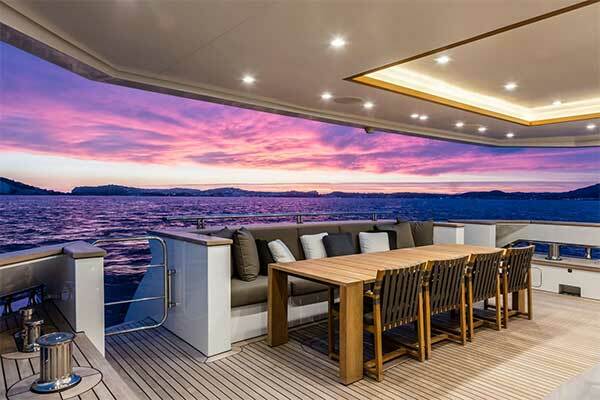 Columbus Yachts in-house workers and long-term subcontractors appreciate the level of detail required in modern yachting. Drawing on our experience in ship construction with our team of welders, metalworkers, carpenters, electricians and painters, they are able to offer a level of service unparalleled in the area.